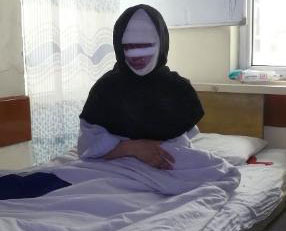 Zahra, a woman who is currently admitted in Isteqlal Hospital (Kabul), claims that her husband first beat her severely and then poured acid on her face. This woman, who has four children, says that her husband had been violent towards her a number of times, but last Friday, he poured acid on her face in front of their children. “I did not think that he would be this cruel. I was bathing my second child when he took a knife and attacked me. When my children stopped him and took the knife away from him, he attacked me with acid,” she recounted. Zahra added that she was given into marriage by her father to his cousin sixteen years ago, when she was just 10-years-old and he was 30-years-old. Her face is completely burned and she cannot see through one of her eyes. The doctors say that her condition is better, but she has seen serious mental trauma. “When she came on Friday morning, she was in a terrible condition, but now she is better. She has 10% acid burns and it will take a month and a half for it to heal,” said her doctor. The Human Rights Commission, has condemned this incident and demanded her case be seriously followed.